Soaking wet, utterly miserable and about to be hit by a blizzard! 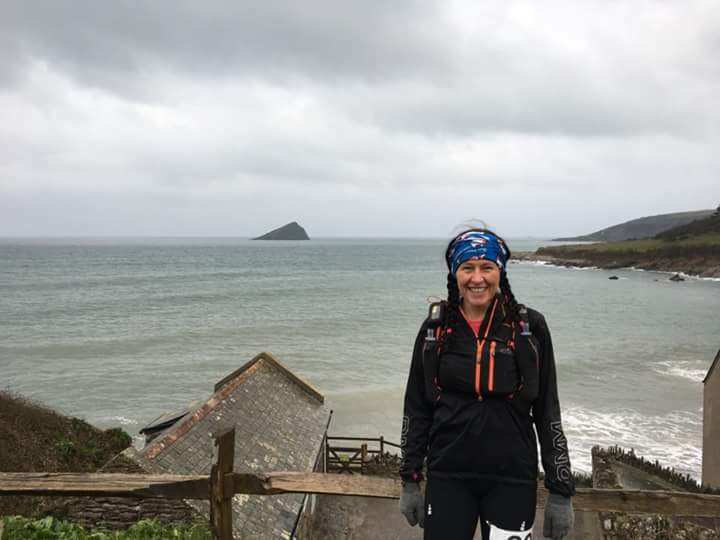 That was Louise Greenwood on the recent Devon Coast to Coast. 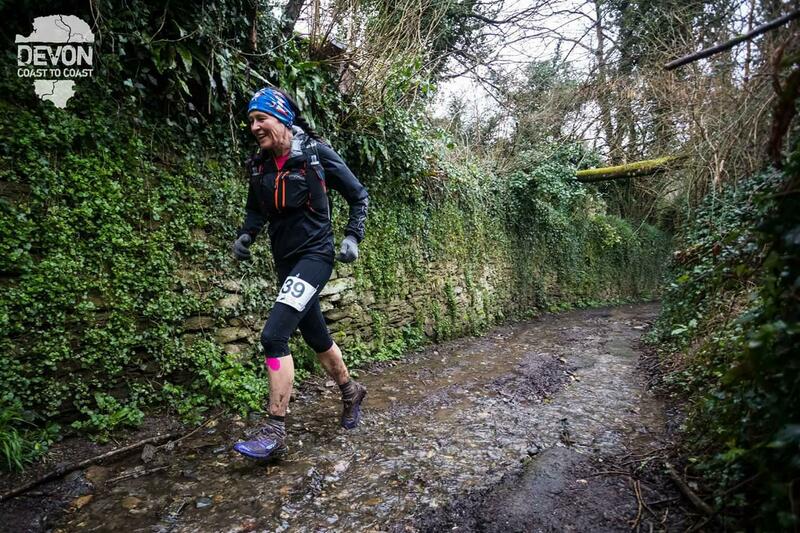 Getting through such lows plus the amazing camaraderie of ultra runners is why she loves it so much. Read on! Louise, could you tell us a little about yourself please? I’m 47 and live in a small village in the South Pennines with my boyfriend Dwane and my dog Kim. They are also runners. I moved here from Portugal 3 years ago and discovered fell and ultra running! 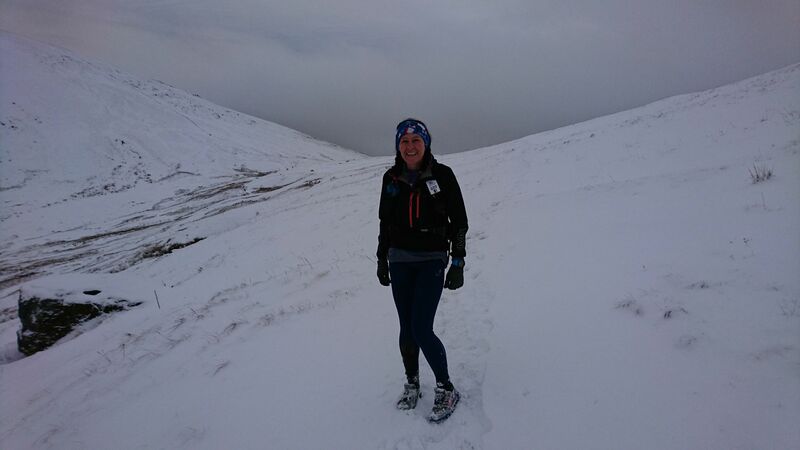 I joined Todmorden Harriers when I first moved here and it was like having an instant family! I am about to start a new career working for the race company Cannonball Events, after spending my working life so far as a joiner. I started running for escapism at a very low point in my life. The Portuguese economy was collapsing and work and money were very scarce, my van was off the road and I couldn’t afford to fix it. I was in a very unhappy relationship, my dog had just died and my mum was diagnosed with bowel cancer (thankfully she has now made a full recovery. Running was free, it got me out of the house, and forced me to live in the moment. I found running the perfect way to combat the stress in my life. I still really value that feeling of living in the moment and also the connection with nature and the outdoors. I run commute and that blast of fresh air and exercise gets me ready to face the day! What is the “Devon Coast to Coast Ultra“? 117 miles from Wembury Beach on the South Coast to Lynmouth on the North Coast. If follows the Erme-Plym trail to Ivybridge and then the Two Moors Way crossing Dartmoor, mid Devon and Exmoor. What was your ultra running experience leading up to this? My first ultra was the local Haworth Hobble, 50k and very cheap and cheerful. I’ve done it three times now and often use the route as a training run. I did the 50k at Keswick Mountain Festival in 2016 which was an absolutely stunning route on a beautiful sunny day. Then the Calderdale Way 50 mile ultra which is another local one. In 2017 I did the South Wales 50 which was very tough – the Brecan Beacons were amazing, the rest was a long hard slog! The Long Tour of Bradwell which is really pretty. Lakes in a Day which was amazing despite really bad weather. I would love to do it again in nice weather because the views must be fabulous. Tour de Helvellyn which was an absolute blast as I ran with some awesome new friends and we had a great day enjoying the Lakes in stunning snowy sunny conditions. My boyfriend and I did the Kong Mini Mountain Marathon series together and won the V40 mixed pairs. I ran the Haworth Hobble as a training run 3 weeks before the Devon Coast to Coast and had a fall, needing 6 stitches in my knee! Ouch! How would you describe your experience of it? It was fantastic! Pretty tough as the ground was so wet, so a lot of the run was through strength sapping ankle deep mud. Dartmoor was beautiful but cold with a brutal headwind. Mid Devon was mostly through the night and seemed to be endless muddy fields and we had blizzard conditions on Exmoor just as night was falling! I ran with people most of the time and teamed up with some guys so we supported each other a lot, with whoever was feeling strongest taking their turn to set the pace, meaning we kept going really well. I felt surprisingly strong through the night and my biggest concern through the whole race was not being warm enough. What training did you do specifically for this? I did a few long training runs locally in the months leading up to it including a 50 mile and the 50k Haworth Hobble. A lot of back-to-back runs and running when I was tired. I ran at night or in the dark a lot over the winter and did a lot of core work and plyometrics. I live in a very hilly area so I felt strong on the hills during the race as I run them all the time. That is some training! And what foods did you eat before, during and after the ultra? I ate heartily the day before. Toasted sandwich and chips and a beer for lunch. A bowl of pasta with roast veg for dinner. Drank a lot of water and electrolytes. I don’t eat a lot during a run so had the following during the ultra: Small serving of soya yogurt and granola, black coffee and grapefruit juice for breakfast before the race; a cereal bar a few hours in, a mug of soup at the quarter way checkpoint, chilli and wedges and black coffee at the half way checkpoint; some porridge, black coffee and a croissant at the three quarters checkpoint and otherwise just grabbed pieces of flapjack or sweets at some roadside checkpoints. I drank High5 tablets and had a few High5 gels and some fizzy rainbow belts when I needed a sugar hit. The magic food was chocolate covered coffee beans which the race organiser gave me at a roadside checkpoint in the night. I’m definitely buying these, they were fantastic! After the race I was given a bowl of carrot and sweet potato soup which really hit the spot! And my favourite post-race chocolate soya milk. That is some serious nutrition! What was your lowest point during your run? The two guys I was running with and myself made a navigation error only 10 miles from the finish and got hopelessly lost. It was the only time we went wrong the whole race and it cost us a few hours. We were wandering around in horrible muddy fields in the pouring ran, utterly miserable and seeing our planned daylight finish slipping out of sight. We were so pleased to finally find the final checkpoint and get on our way to the finish. Unfortunately I was wet and cold by then and we still had the blizzard to come – but by then the end was in sight. Mentally, how do you get through that? These was no option apart from sitting down in the mud and crying! We couldn’t even give up because we were nowhere near civilization, nobody had a phone that still worked and we were utterly lost. It was just a case of supporting one another, trying to stay chirpy and knowing we would get out of it eventually. We ended up flagging down a farmer and asking him where we were. He offered us a lift in his horsebox, which obviously we declined, but it made us laugh so much that we instantly forgot our misery! What do you think makes ultra running so special? Apart from the challenge of pushing yourself to the limit, there’s the amazing countryside that you are totally immersed in as the real world slips away. And the fantastic camaraderie among ultra runners. I’ve met and run with some truly lovely people who have become great friends. Trail running in general has grown and there are so many ultras to choose from. It’s a sport that’s very inclusive so there are people of all ages and shapes and sizes. And there’s a lot more media exposure of ultra running in the last few years. You recently marshaled at another ultra, the Canalathon. What perspective did that give you on ultra running? I marshal and sweep a lot of events, both for Cannonball Events and for my club. The Canalathon is very popular as a first ultra as it’s flat and easy navigation. We work at the last checkpoint which is just beyond marathon distance for the 50k runners and it’s so lovely to see the euphoria when someone realises they have now run further than they ever have before. The absolute highlight of the day for me was that the first and second place on the 75k were taken by women. What were you most impressed by that day? As always, by the fortitude of runners giving it everything they have, and by how happy they all seemed to be, even when they were tired and in pain. And as said before, the female 1 & 2 in the 75k. 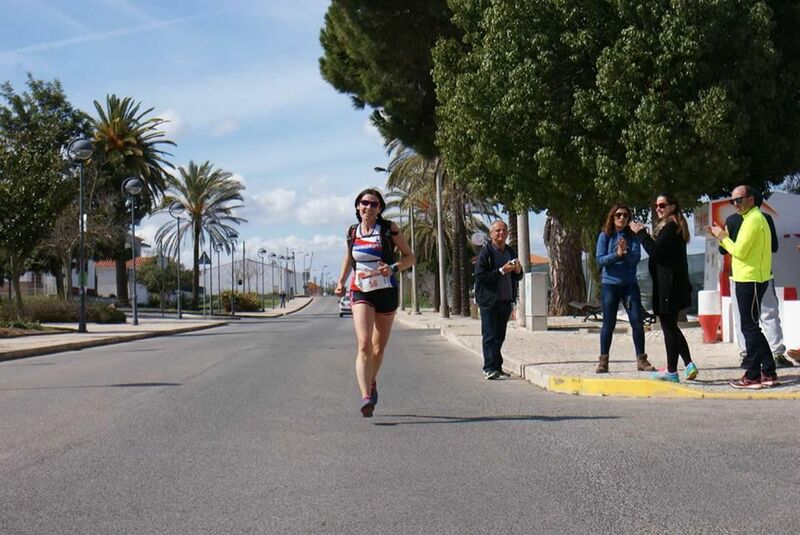 How can we encourage more women to run ultras? I think ultra running is already very popular with women. There are some great role models for us and also for the mid pack runners rather than those chasing podium position, the friendly atmosphere among runners is very welcoming for women. I would like to see more features in Trail Running magazine for example about ordinary people, men or women, who are achieving ultra distances. This summer the Pen Llyn 75 mile ultra and the Welsh Vegan 3000s. I’m trying to get to Wales as much as possible in preparation for the Dragons Back in 2019. I’m also marshaling at Cape Wrath Ultra. I’d like to do Tour de Helvellyn again, especially if I can meet up with friends and make it a fun pre-Christmas outing. I’m defending my title of Todmorden Harriers Ultra Champion which I’ve won for two years so I’ll be doing Open to Offas, which is in our Championship, and maybe some of the others races in the club list. 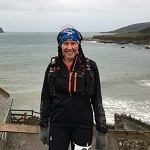 I plan to celebrate my 50th birthday in 2020 by doing the Joss Naylor Lakeland Challenge, either on my birthday at the end of April, or on my Dad’s 70th birthday in June. My word!! What else do you think you’re capable of achieving? I’m very drawn towards the Spine. The Pennine Way runs through our local area. I marshaled at the Hebden Bridge checkpoint this year and it just made me want to do the race so much! I have a friend who’s also Spine curious so we’re planning on recceing sections of it, starting with Edale to Hebden Bridge. Any final words of wisdom for the readers? It really is all in the mind. Unless there is a physical injury that stops you, then if you believe you can do it you will. The human body evolved to be efficient at moving fast over long distances, it’s what we’re designed to do. Remember that and believe in yourself – and always stay well hydrated!